Click here to see a large list of online booking capable Vancouver accommodations. Vancouver is British Columbia's largest city. It has all that a major city can offer for urban fun: theatres, shopping, symphony, opera, nightclubs, Chinatown and more. But Vancouver also is on nature's doorstep with hiking, biking and nature walks all within minutes of the downtown. With the weather, in winter, you can golf in the morning and ski in the afternoon! Vancouver is taking all steps to gear up for the 2010 Olympic and Paralympic Winter Games, which occur February 12-28 and March 12-21, respecitively. Many venues are ready now Winter Games fever is high in Canada already! Communities like Richmond, Delta and Burnaby are all providing venues and support for The 2010 Winter Games. With its mild climate, Vancouver has summers that aren't too hot; winters that aren't too cold; springs are early; and autumns long. Book Vancouver BC hotels online and investigate a boutique hotel, executive suite hotel, or a family-oriented Vancouver accommodation. 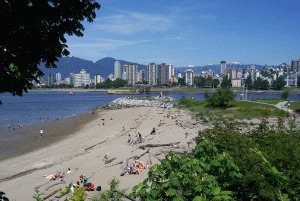 Vancouver also provides access to the Sunshine Coast, a part of the BC mainland that is accessed by ferry boat. Check it out by choosing our Sunshine Coast link. Located on Granville Street in Central Vancouver, this luxury non-smoking bed and breakfast is the only one in Vancouver boasting a 5-star rating. The inn offers spacious, bright suites with a flat-screen TV and iPod docking station. Each suite includes a spacious seating area and keyless entry. Free Wi-Fi is available in all the suites. A refrigerator and coffee-making facilities are provided. Our Vancouver B&B is economical and comfortable, a 100 year old Victorian heritage house. It is located in the safe but vibrant Kitsilano neighborhood where you can enjoy strolling the beautiful leafy and flower lined streets. A short walk to Stanley Park, Kits beach, Downtown, Yaletown and Granville Island. No need for a car and just Half a block from excellent public transit. Our Four Diamond downtown Vancouver hotel treats you to plush amenities and uncompromising service with the largest guestrooms, most impressive meeting and event facilities, romantic wedding venues, and accomplished catering staff of any accommodation in downtown Vancouver. Enjoy our onsite dining options including Latte Café & Bistro, Mosaic Grille and the Mosaic Bar. Our downtown Vancouver hotel is steps from trendy Yaletown bars & restaurants, Robson Street shopping, Granville and Davie Street nightlife. Use our free Wi-Fi and world-class business amenities. 24-hour Fitness Centre, indoor heated pool and delicious dining options. Underground pay parking. This Heritage style Vancouver hotel best suits the budget-minded traveller that seeks quality "no-frills" accommodations and budget rates! Located on the edge of the downtown core, guests are only 1 block from Chinatown, 5 blocks from historic Gastown and enjoy easy access to shopping, dining, entertainment, Stanley Park, Granville Island, Grouse Mountain, and other major city attractions. Since 1985, Diana's friendly and impeccable service, helpful tourist information from extensive travels have earned her a great reputation among visitors. Her fresh coffee, wholesome breads, and seasonal fruits will start your day right. Diana's large modern home is nestled behind a beautifully landscaped garden with palm trees, yellow roses and mountain views. TV, VCR & free wireless Internet. Cassandra Hotel offers excellent value to the traveler whether on a business trip or on a pleasure holiday. Our central Vancouver lodging location, quality, friendly courteous service and close by amenities ensure that you will enjoy your stay with us. We are just a short drive from shopping, Gastown, Aquarium, Symphony, Stanley Park, Art Gallery, Science World, & many other Vancouver attractions. Our Vancouver hotel is a designated heritage building, located on English Bay, beside Stanley Park and just 5 minutes from downtown Vancouver. Built in 1912, the Sylvia Hotel is a city landmark and one of Vancouver's greatest treasures. The location is a favourite for business travelers wanting to be out of the busy downtown core, for families vacationing on the beach or for romantic getaways. We an elegant and romantic B&B accommodation located in Vancouver's West End near Stanley Park and English Bay. Pamper yourself in our adult-oriented, smoke-free home. 6 cozy rooms with private bathrooms are furnished with antiques, QS beds, bathrobes and duvets dressed in crisp Ralph Lauren linens. Enjoy our gourmet breakfasts, a glass of port by the fire, or a whirlpool bath in our luxury suite. Located on Vancouver's dynamic harbourfront, we proudly embrace a sustainable philosophy with upscale comfort, personalized service and unparalleled West Coast views. In our beautifully renovated rooms, we have 24 hour in room dining, flat screen TVs, wireless Internet, pillow top beds, terry cloth robes, Keurig machines, Bodums on request and more. Steps away from the Vancouver Convention Centre. Located less than 3 km from downtown Vancouver, this property is a 6-minute walk from Connaught Park. It offers a fresh breakfast each morning and rooms with free Wi-Fi. Every room includes a flat-screen cable TV, a private bathroom as well as a telephone and alarm clock. Science World is just 6 km away. Moda Hotel in downtown Vancouver, offers a unique hotel experience for people from all over the world to enjoy. With its hip and historic allure, this Vancouver hotel offers 67 chic guestrooms and suites, an inspiring collection of establishments including the award-winning Cibo Trattoria and Uva Wine Bar, the stylish Red Card Sports Bar and specialty beer and wine store, Viti Wine and Lager. Our Vancouver suites include 4 self catered kitchen suites near Granville Island that are perfect, family friendly Vancouver accommodations. Recently rebuilt, our charming 1929 manor offers old world charm with modern amenities. Walk to upscale South Granville shops or restaurants. Keyless entry, dedicated parking spots yet close to transit. This Vancouver city center hotel includes Spa facilities and an indoor swimming pool. full kitchen is offered in each suite. Vancouver Convention Center is a 10 minute walk away. All suites feature a lounge with a flat-screen cable TV. Featuring modern furnishings, each spacious suite has a private balcony with city views. La Grande Residence is just a 20 minute walk from BC Place. Our Vancouver hotel is known as the 'Castle in the City' and reflects timeless luxury and history. We are steps from Vancouver's shopping and entertainment district. Guests will feel at home as our canine ambassadors, Mavis and Beau, welcome them and our knowledgeable Concierge team makes travel suggestions. Amenities include a health club, indoor pool, Absolute Spa and Sitka Physio & Wellness.